The Olive-headed Weaver Ploceus olivaceiceps is a miombo weaver typically seen foraging quietly in the canopy, and occurring in eastern Africa. 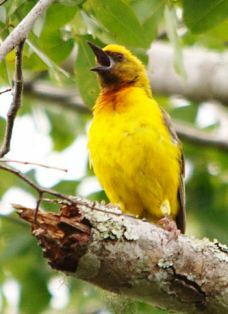 The male Olive-headed Weaver is slender-billed with a distinctive golden crown, olive face, throat and upperparts, orange-chestnut lower throat and breast; the upperparts are plain, and wings and tail dark; and the eye is red. The female has a wholly olive head, and less chestnut on the breast. The juvenile is similar to the female but with a yellow chin and throat. The poorly-known Usambara Weaver Ploceus nicolli is similar to this species, but their ranges do not overlap. 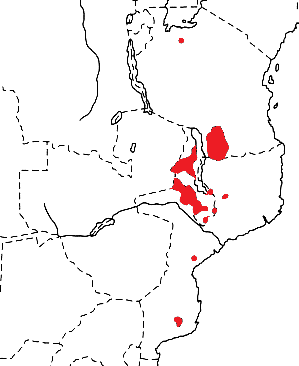 The Olive-headed Weaver occurs in Tanzania, east Zambia, Malawi and Mombique (see map left, based on Birds of Africa). The northern-most record (from Mwamazengu, Tanzania) is from as recently as 1998. The southern Mozambique population has been described as a subspecies but the description was based on inadequate comparative specimens, and thus the species is treated as monotypic. The isolated population near Panda in southern Mozambique is separated by more than 600 km from any other known sites. There are about 100 pairs in the Panda area compared to a total population estimate of about 20000 pairs (1998). This species is near threatened, but the situation may worsen with increasing habitat loss. The Olive-headed Weaver inhabits mature miombo (Brachystegia) woodland where Usnealichen is abundant. It feeds on insects, including butterflies and moths, beetles, bugs, and small wasps. The Olive-headed Weaver forages on tree trunks, clinging to the bark, and moving along the under and upper surfaces of branches, probing almost entirely in lichens. It is usually solitary or found in pairs, even when foraging in mixed bird parties. The Olive-headed Weaver is a monogamous, solitary nester, and the pair remains together all year. The nest is constructed entirely of Usnea, and is always placed in a thick clump of lichen, using living strands growing on a branch as a basis. The nest is placed on the underside of a thick branch rather than the tips of twigs. The nest is sited up to 18 m above the ground, generally near the crown of a tree. A short spout is usually added to the nest, but some nests lack a spout. Both male and female build the nest. The Olive-headed Weaver has 6 PHOWN records, all from the Panda area in Mozambique - some of these records show photos of the adults but nests were probably present nearby. Many more PHOWN records are needed for this species from all parts of its range (see PHOWN summary). Submit any weaver nest records to PHOWN (PHOtos of Weaver Nests) via the Virtual Museum upload site.